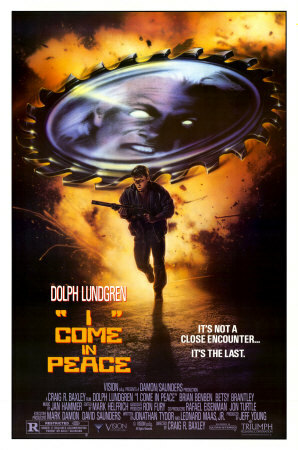 Dolph stars as Jack Caine, a Houston detective who is partnered up with straight laced FBI agent Larry Smith (Brian Benben) to investigate the seemingly strange murders of heroin induced victims that had their brains sucked out. The two cops learn that the one behind it is an Alien drug dealer (Matthias Hues, who would become a legendary B.movie heavy) who has come down to earth to harvest humans for their endorphins, hot on his trail is an alien cop that joins forces with our heroes. I Come In Peace is very derivative and built upon tiresome cop movie clichés. However I Come In Peace works despite itself, and wisely director Baxley goes the action route and in doing so delivers a better than average Lethal Weapon/The Hidden clone. Also what sells the story is the on screen chemistry between Lundgren and Benben who have some quirky moments adrift the carnage (and clichés), but the main selling point is (of course) the action, to which I Come In Peace scores the highest marks on. I Come In Peace might not be a bona-fide classic but for fans of the genre, it stands head and shoulders above most of its ilk and delivers exactly what it promises. You might remember my old site, or you might not, as it turned out I had an assignment revolving around making a website ergo I decided to make one after Geocities went belly up and i lost it all, it's gonna be a long process but such will get up to date eventually.